Wets: 468, each entry has five sets of Firestone’s new rain tire available this weekend. The Firestone primary and alternate tire specifications for Toronto remain the same as those used earlier this season on street circuits at St. Petersburg, Long Beach, Brazil and Detroit. The specs feature updated tread compounds for 2012 applied to the same Firehawk street-course tire construction used throughout 2011. Firestone Racing has available this weekend the new-for-2012 rain tire specification that debuted last month in Detroit. The tread pattern design of the new rain tire is inspired by the Firestone Firehawk Wide Oval Indy 500 passenger-car tire. 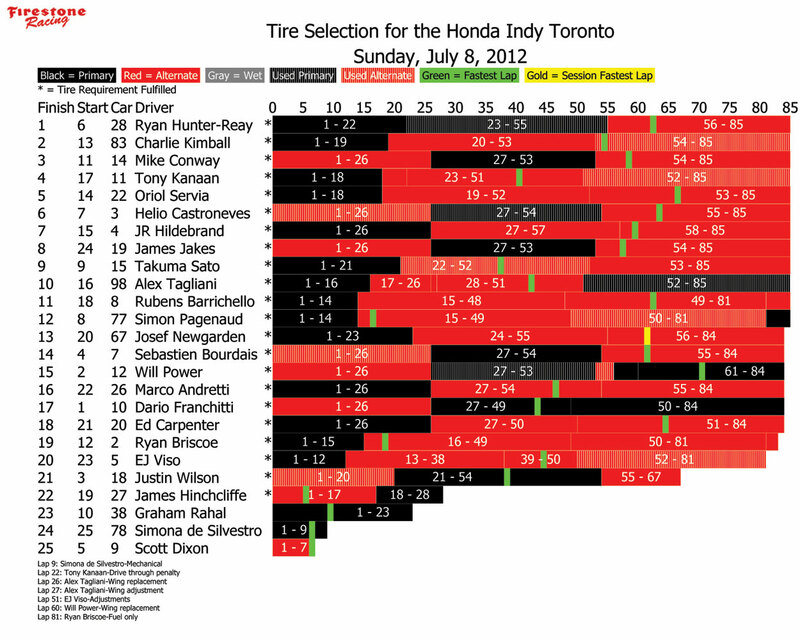 Incurring 10-spot starting grid penalties for unapproved engine changes: 19-Jakes, 27-Hinchcliffe, 78-de Silvestro, 98-Tagliani. – 28-Hunter-Reay makes contact with rear of 12-Power in turn 3 early in session; right front damage to Hunter-Reay, rear wing assembly damage for Power; no flag. – 78-de Silvestro contacts outside wall in turn 2 with ~5 mins left; left side damage, red flag. – 67-Newgarden spins exiting turn 10 with ~50 mins left; red flag, no damage. – 28-Hunter-Reay drives into the tires in turn 8 with ~45 mins left; red flag, no damage. – 67-Newgarden stalls on course early in session; red flag. – 38-Rahal spins exiting turn 6 with ~30 mins left; red flag, no damage. – 5-Viso into the tires in turn 3 with ~20 mins left; red flag, no damage. – 18-Wilson into the tires in turn 8 with ~5 mins left; red flag, damage to front wing. – Pit accident between 18-Wilson and 7-Bourdais with ~50 minutes left in session; red flag; four crew members injured, two transferred to hospital for evaluation. Session extended by 10 minutes. – 98-Tagliani backs into tire barrier in turn 8 with ~10 mins left in session; 18-Wilson takes the corner wide and hits the tires next to Barrichello, narrowly missing contact; red flag.